The Caulfield Classic is a Group 3 event held at Caulfield Racecourse in late October on Caulfield Cup Day as a lead-up to the VRC Derby. The Ladbrokes Caulfield Classic is a Group 3 event for three-year-old staying types run at Caulfield Racecourse in mid-late October on the same day as the first leg of the Spring Cups double – Group 1 Caulfield Cup (2400m). Run over a testing 2000m, the Caulfield Classic is one of four staying events on the program, making this a great day for staying events. The Caulfield Classic field is comprised strictly of three year olds who compete under set weight conditions. For this reason, high quality horses generally rise to the top of the results. With $350,000 in prize money on offer, the Caulfield Classic is easily one of the most lucrative Group 3 races during the Melbourne Spring Racing Carnival and draws three-year-olds that could continue onto the Group 1 Victoria Derby (2500m) at Flemington on the first day of the Melbourne Cup Carnival. 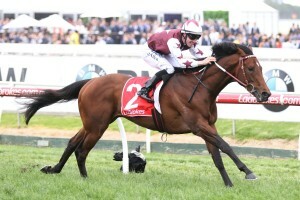 Polanski (2013) was the last horse to complete the Caulfield Classic – Victoria Derby double. Three-year-olds in the Caulfield Classic field may be backing-up on the quick turnaround after contesting the Group 1 Ladbrokes Caulfield Guineas (1600m) the Saturday prior. There is a $500,000 bonus on offer to any three-year-old that wins either the Caulfield Guineas or Thousand Guineas as well as the Caulfield Classic, formerly known as the Norman Robinson Stakes. The 2017 Ladbrokes Caulfield Classic ran on Saturday October 21, 2017 at Caulfield Racecourse. See below for the official Ladbrokes Classic 2017 Results & Finishing Order, following the link to read more about the powerhouse win by the Darren Weir-trained Cliff’s Edge who lead all-the-way before bolting home to defeat Tangled by nearly three lengths on way to the VRC Derby during the Melbourne Cup Carnival. It’s a wide open field with five of the eight under double figures and four battling for top spot. Have to lean towards MAIN STAGE ($4) with the rails run. Yet to finish out of the money and top two in his past four starts. Latest win was from out wide (13 of 14) at Flemington in the Listed UCI Stakes (1800m). Fancy that form in this to stack-up getting up to 2000m. He ran down the flying frontrunner (Cliff’s Edge) there and was improving. TAVISTOCK ABBEY ($5) is the market mover chasing a third win on the trot. Beat Main Stage narrowly over Flemington 1800m on September 27. Missed the UCI Stakes, but has trialled in the interim and gets the chance to show-up again in his first black-type run. CLIFF’S EDGE set a frantic pace in the UCI Stakes but was run down by Main Stage. The Darren Weir-trained colt is a definite top three chance again with previous winning form at Caulfield in a small field this weekend. The Ladbrokes Caulfield Classic odds will be detailed below complete with links to the race sponsor’s markets so you can back your Ladbrokes Classic Tips in at the best prices this season through Ladbrokes.com.au. The 2017 Ladbrokes Caulfield Classic field and barrier draw is set for release on the Wednesday leading up to Caulfield Cup Day and will be detailed in full below once announced by Racing Victoria. The official Ladbrokes Caulfield Classic Final Field announcement follows early nominations taken at the start of August that are then followed by First Caulfield Classic Acceptances (in late September) and Second Caulfield Classic Acceptances (in early October). The official Ladbrokes Caulfield Classic 2017 Field attracted just the eight hopefuls including the Chris Waller-trained Tangled coming off a lead-up second in Sydney’s Group 1 Spring Champion Stakes (2000m). Main Stage came up trumps with barrier one looking for successive wins after success at Flemington in the Listed UCI Stakes (1800m). The Ladbrokes Caulfield Classic 2017 second acceptances featured 34 three-year-olds including Catchy who ran third in the Ladbrokes Caulfield Guineas last Saturday and the upset $101 winner of that mile feature Mighty Boss. Early in 2014, the Melbourne Racing Club (MRC) announced that they would be replacing the Norman Robinson Stakes with the Caulfield Classic, a new event that would boast a massive $750,000 prize money with an additional $250,000 to first place if they also won either the Thousand Guineas or the Caulfield Guineas. However, the Caulfield Classic will still share the history of the Norman Robinson Stakes. Caulfield Classic prize money is down to $500,000 for the 2016 edition and the race is sponsored by Ladbrokes.com.au. When the race was first inaugurated in 1978, it was held over 2000m and ran as a listed race. For 1998 and 1999, the Caulfield Classic ran as a Group 3 event, and then for five years up until the 2005 edition the race held Group 2 status. Since 2005 however, it has remained at Group 3 following a downgrade. It is likely that the new injection of prize money in 2014 will result in the race being upgraded again. The Caulfield Classic has been known by several other names in the past, including the Norman Robinson Stakes, Wallace Stakes and Steeves Lumley Stakes. The Caulfield Classic is a good leadup event to the Victoria Derby, although as of 2014 the structure of the field might prevent that. Notable Caulfield Classic winners include Nothin’ Leica Dame (1995), King Delamere (1983) and Hvasstan (2012). Caulfield Classic results since 2000 are below.